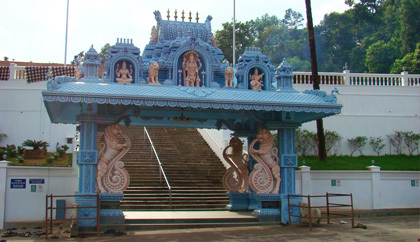 Horanadu is a hindu holy city located in Chickmagalur district, Karnataka. The Horanadu Annapoorneshwari Temple is very famous and the deity at the Annapoorneshwari Temple at Horanadu is Annapurneshwari. The idol of goddess Annapurneshwari was established in 1973 in the temple. Distance from Mudigere to Hornadu, Karnataka is 70.0 km and travel time is around 1 h 50 min via SH 66. Horanadu lies amidst beautiful Malnad at a distance of 330 KM from Bangalore. Distance from Sringeri is 75 Kilometers. Direct buses run from Bengaluru to Horanadu everyday. Bus services are provided by KSRTC and private companies as well. Everyone who visits Horanadu Annapoorna temple is provided with a three course vegetarian meal (including a dessert made from Dhal or Lentils) irrespective of their religion, language, caste, or creed. Male visitors to the temple have to remove their shirts and preferably cover their shoulders with a towel or a shawl as a symbol of respect and humility in front of god. The main deity of Annapoorna is made of gold and she looks so beautiful. A sense of fulfilment is felt when a person visits this temple and it is said that a person who seeks the goddess' blessings would never have any scarcity for food in life. It is believed that lord Shiva once had a curse and that this curse was reversed when the lord visited Goddess Annapoorna and sought her blessings. The route to the temple traverses ghats, amazingly dense forests and vegetation. It feels like the most beautiful route one can ever take, with nature in all Her resplendent glory. A trip to the Horanaadu Aadishaktiyatmaka Annapoorneshwari temple would be most fulfilling if all pilgrimage spots en route to the temple are also included in travel plans. Some of the places that will be encountered in that order would be Kukke Subrahmanya, Dharmasthala, Sringeri, Udupi Krishna temple and Kollooru Mookaambike, Kalaseswara temple in Kalasa, and then the Horanaadu Annapoorneshwari temple. Horanadu Kalaseeshwara Temple Horanadu Kalaseeshwara Temple is located 92 km south west of Chikmagalur in Kalasa. This temple is dedicated to Lord Shiva, found surrounded on three sides by the river Bhadra. The marriage of Shiva-Parvathi is celebrated here every year. Distance from Hornadu to Dharmasthala, Karnataka is 94.5 km and travelling takes around 2 h 42 min via SH 106 and NH73. Distance from Hornadu to Thrissur, Kerala is 577.5 km and takes around 12 h 6 min via NH544. Distance from Hunsur to Hornadu, Karnataka is 223.5 km and travelling takes around 5 h 5 min via SH27.